Hip hop heads, 7" buffs - Check this one! Earth shattering early 80's Bronx sounds transmitted back to us as fresh as the day they were terraformed! 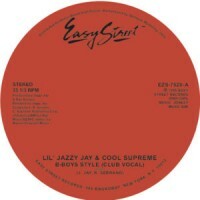 NYC's Easy Street label is known for its contributions to house music, electronic disco and boogie, but there were a handful of early rap singles on the label too, including this megaton bomb from the freshly monikered Lil' Jazzy Jay & Cool Supreme from '85, all the way live. This record has it all, dubbed out FX, vox, cuts and brain frying vocoders..... not to mention the monolithic drum machines and dope braggadocios rhyming. This is the FIRST TIME this mid 80's rap rarity has been made available on a 7". Both the 'club vocal' & 'dub instrumental' are featured here, cut at 33 rpm for maximum sonics. Shout out to Easy Street, %100 legit re-issue, re-master & re-press, essential wax!